Single and Three-incision LC has been reported to be safe and feasible in various clinical trials that compare with standard Four-port LC. But no study compare between each groups. This study reports a prospective pilot study that compare the clinical outcomes of the Single-incision versus Three-incision LC. 20 consecutive patients who underwent elective LC , and only symptomatic GS , don’t had history of cholecystitis or previous surgery before between Sep 2009 – Jan 2010 by single laparoscopic surgeon were included in this study. Of 20 LCs performed at participating unit during the study period and were separated to each of the procedures randomized equally. The groups were well matched for demographic data. Postoperative pain at port sites was assessed on the 24 hr and 48 hr after surgery, using a 10-cm unscaled visual analog scale (VAS). All patients and nurse don’t know the type of operation. And all patients was covered in the same dressing and corrected pain score in the same site. Outcome measures includes analgesic and narcotic requirement , length of the operation, postoperative stay and complication. Postoperative stay, time to return to normal activity were similar between two groups. 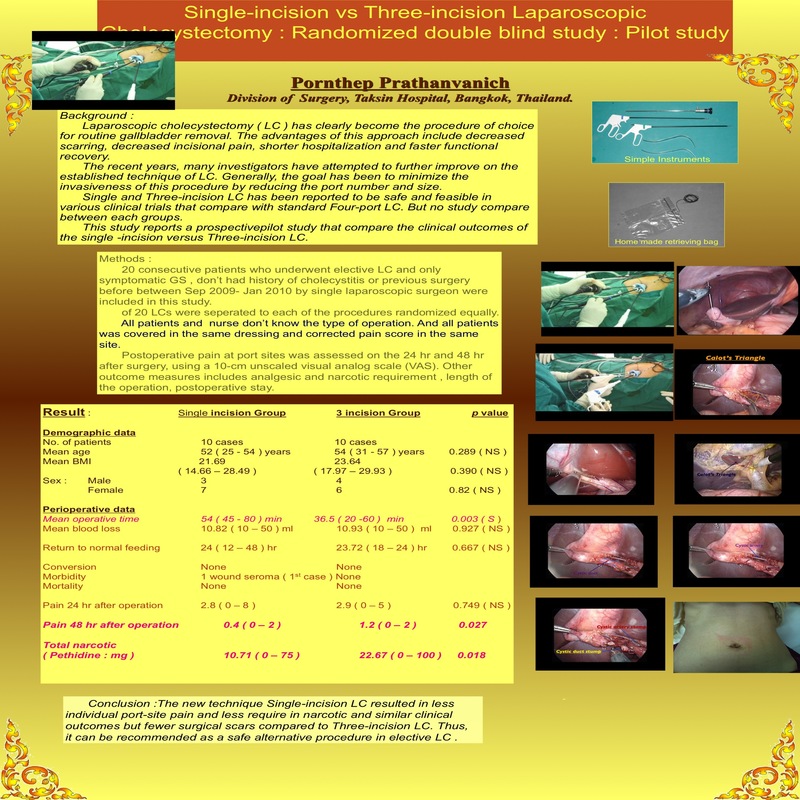 The new technique Single-incision LC resulted in less individual port-site pain and less require in narcotic and similar clinical outcomes but fewer surgical scars compared to Three-incision LC. Thus, it can be recommended as a safe alternative procedure in elective LC .